Prototype: German Federal Railroad (DB) class 81 heavy tank locomotive, a stake car, a "Gasolin" tank car, and a low side car, all painted and lettered for the German Federal Railroad (DB). Model: The locomotive has a digital decoder and a special motor. 4 axles powered. Traction tires. The triple headlights change over with the direction of travel, will work in conventional operation, and can be controlled digitally. The set has a removable model of a bulldozer. 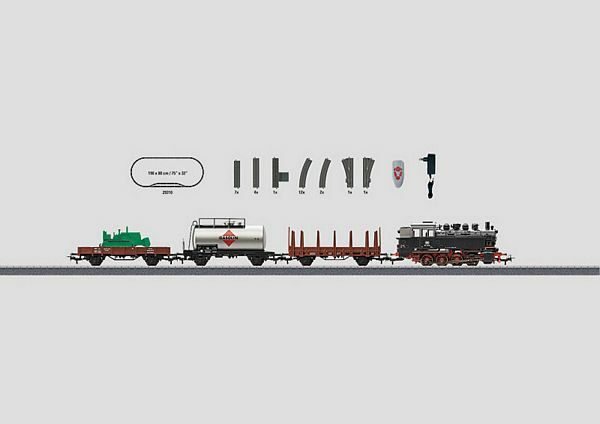 The locomotive and the cars all have Relex couplers. Train length 47.3 cm / 18-5/8". Contents: 12 no. 24130 curved track, 5 no. 24188 straight track, 7 no. 24172 straight track, 2 no. 24224 curved track, 1 no. 24612 right turnout and 1 no. 24611 left turnout. A switched mode power pack and a multiple train digital locomotive controller. This set can be expanded with the C Track extension sets and with the entire C Track program. The 74491 electric turnout mechanism can be installed in the turnouts.